Artist’s impression of the baby star TMC-1A. The star is located in the center and surrounded by a rotating gas disk. Gas is infalling to the disk from the envelope further out. 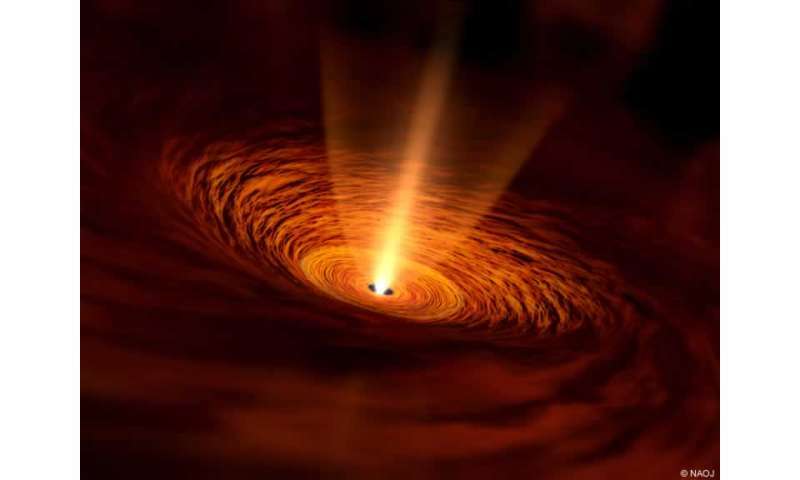 Researchers using the Atacama Large Millimeter/submillimeter Array (ALMA) have made the first direct observations delineating the gas disk around a baby star from the infalling gas envelope. This finding fills an important missing piece in our understanding of the early phases of stellar evolution. A research team, led by Yusuke Aso (a graduate student at the University of Tokyo) and Nagayoshi Ohashi (a professor at the Subaru Telescope, National Astronomical Observatory of Japan) observed the baby star named TMC-1A located 450 light years away from us, in the constellation Taurus (the Bull). TMC-1A is a protostar, a star still in the process of forming. Large amounts of gas still surround TMC-1A. Stars form in dense gas clouds. Baby stars grow by taking in the surrounding gas, like a fetus receiving nutrition from the mother's placenta. In this process, gas cannot flow directly into the star. Instead it first accumulates and forms a disk around the star, and then the disk feeds into the star. However, it is still unknown when in the process of star formation this disk appears and how it evolves. Lack of sensitivity and resolution in radio observations has made it difficult to observe these phenomena. "The disks around young stars are the places where planets will be formed," said Aso, the lead author of the paper that appeared in the Astrophysical Journal. "To understand the formation mechanism of a disk, we need to differentiate the disk from the outer envelope precisely and pinpoint the location of its boundary." Using ALMA, the team directly observed the boundary between the inner rotating disk and the outer infalling envelope with high accuracy for the first time. Since gas from the outer envelope is continuously falling into the disk, it had been difficult to identify the transition region in previous studies. In particular, the tenuous but high speed gas in rotating disks is not easy to see. But ALMA has enough sensitivity to highlight such a component and illustrate the speed and distribution of gas in the disk very precisely. This enabled the team to distinguish the disk from the infalling envelope. The team found that the boundary between the disk and envelope is located 90 astronomical units from the central baby star. This distance is three times longer than the orbit of Neptune, the outermost planet in the Solar System. The observed disk obeys Keplerian rotation: the material orbiting closer to the central star revolves faster than material further out.The high-sensitivity observations provided other important information about the object. From detailed measurement of the rotation speed, the research team could calculate that the mass of the baby star is 0.68 times the mass of the Sun. The team also determined the gas infall rate to be a millionth of the mass of the Sun per year, with a speed of 1 km per second. Gravity causes gas to fall towards the central baby star, but the measured speed is much less than the free-fall speed. Something must be slowing the gas down. The researchers suspect that a magnetic field around the baby star might be what is slowing the gas. "We expect that as the baby star grows, the boundary between the disk and the infall region moves outward," said Aso. "We are sure that future ALMA observations will reveal such evolution." Care to expand on that, oh wise one? Or are you about to regale us with a bunch more electric cretinism?